Time does, indeed begin to heal all wounds. And then there are the reminders of loss that punch you in the gut. We received flowers and cards Friday from three different corners of the country in Sharon’s memory that left us perplexed at the coincidental timing and sad all over again. But yesterday I plowed through another chunk of my manuscript and am finally facing down the last quarter of what was apparently only the skeleton of a story. My editorial process has had me add more than 10,000 words so far, making this novel officially my longest. The other road I traveled this week was out to the Antietam National Battlefield. The field trip was the capstone to a leadership class at work. We had been given a 90-page booklet with blow-by-bloody-blow details of the Antietam Battle of the Civil War as part of our preparation, but I got five pages in and had the same queasy response as when I’d read All Quiet on the Western Front. So I waited to see how being in that region listening to an historian recount the facts of the battle as history recorded them would make me feel. It was actually one of the most impactful history lessons I’ve ever experienced. And other than that moment in the Bloody Lane, when I felt the weight of sorrow and bewilderment for the sheer number of lives wasted (for the “trivia”-minded of you, this battle accounted for the highest single-day number of deaths of Americans), the focus of the day was on the many WTF moments when failures of leadership ensured the Civil War would continue for another three bloody years. It put leadership in an entirely different context and emphasized the importance of communication and emotional intelligence in ways that aren’t quite as visceral in merely written words. Even more important, the ability to nurture those who follow you so they are able to successfully step into your shoes when their time comes assures continuity and the ongoing ability to meet the vision mapped for the future with quality and success. The interesting thing in all of this is that the experience was guided in the spirit outlined in Lee Thayer’s book, The Competent Organization. As I mentioned when I started the class, there are certain generational divides that made me have to read the text as a philosophical treatise–his opinion, to be studied as a way to reach consistent success in a business context. On the other hand, his exhortations not to let people “default themselves” (take the easy path), or to “allow for a plan B” (be content with less than whatever goal you had committed to), strongly resonated. In fact, I had heard the quote I’m including here in some format back in college. It’s always rung true to me because I’ve only ever pursued the one path that’s ever opened to me at any given time. Mostly that’s meant big challenges along the way. 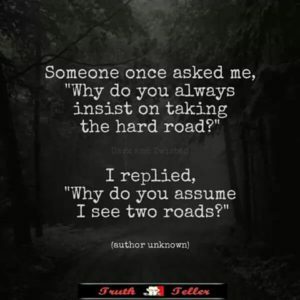 My takeaway, merged now with Thayer’s words, is that when your goals are some form of audacious (and I would absolutely consider becoming a published fiction author who can live off the earnings of their words one of the most difficult goals a person can set themselves), you have to expect difficulty. Be willing to work against the pull of the crowd’s tide. I remain grateful hubs is so supportive. So my BHAG micro-goal of the week: To finally finish the editing phase for The Builders and publish it. While you wait to see whether I achieve it, check out my ROW80 compatriots, and come back next week for my regularly scheduled report. I was a Civil War buff when I was younger. Someone gave me a two-volume set in paperback, one blue, the other gray, rich with letters from the battlefront and home front. That must have been quite moving to stand on the actual battle grounds. Sorry I haven’t kept up with your blog! Sounds like you’re getting some good work done on your rewrite. Unlike myself. I seem to have wandered onto the Resistance Highway again. While sharing some of the loss you are experiencing (gentle thoughts to you and your husband), I am buoyed by the comfort and joy you were able to discover in your editing and battlefield trip. Sounds like it was a perfect presentation… the facts are never as interesting as how the facts occurred imho. My dad is a U.S. Civil War reenactor and my eldest daughter is deeply interested in the period as well, so we have books on it all over the house. Have you read The Boy’s War? It’s very interesting. It’s a collection of war letters and accounts written by kids age 12-17ish or so who fought in it.